Movie: "O.J. 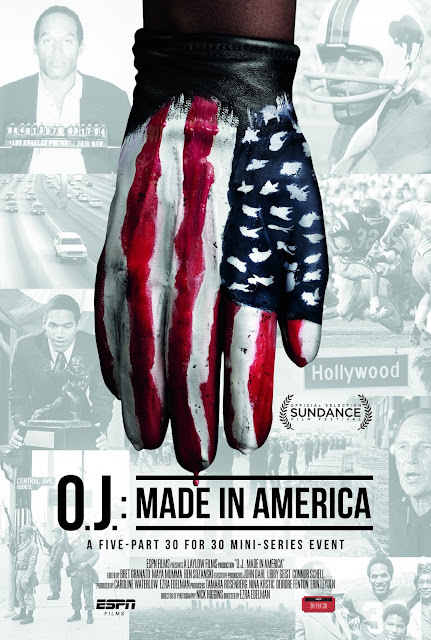 Made in America"
An in-depth look into OJ Simpson, the athlete, the actor, the man, the myth, and the monster, from his early life through his ultimate incarceration. "O.J. : Made in America" is a multiple part documentary directed by Ezra Edelman. It tells the story of the now infamous O.J. Simpson through interviews with his friends, enemies, prosecutors, journalists, defense attorneys, and the family members of his victims, Nicole Brown and Ron Goldman, of whom he was acquitted of murdering. It juxtaposes Simpson's life with the history of race relations in America. It displays how a history of oppression and distrust in the system set the stage for a man to get away with double murder. This is an extremely compelling documentary series that helps show how America became so captivated by what is now known as "the trial of the century." It looks into how a man like O.J. Simpson, who throughout the civil rights era never supported the movement and never contributed anything to help achieve equal rights for black people, someone who surrounded himself with white friends in Brentwood, CA and used the n-word to describe other black people, somehow became an icon of the civil rights movement while on trial for murder. It also examines the fallout that came after the fact, how O.J. becoming a symbol of the movement possibly hurt it in the long run. "O.J. : Made in America" is an extremely well made documentary. It is supremely researched and ultra loaded with facts, testimonies, interviews, photographs, and parallels. It is well shot and keeps viewers thoroughly engaged throughout its very long, very detailed run time. When we say long, we mean it, as this documentary clocks in at 7 hours and 47 minutes in total. It must be watched more like a television miniseries, especially considering the weight of the case from start to finish and all it encompasses. There is a lot that went into making this movie and it covers a lot of information over this very long period of time. Edelman discusses the Rodney King beating and trial, as well as the shooting of Latasha Harlins to set the stage and show where race relations were in America. There are many other issues discussed that help create the perfect setup to be exploited by a man who up until that point never gave two shits about any of it. There is also a lot in this documentary that can anger you on both sides of the equation, nothing more so than the fact that, in all the talk of cops, conspiracies, and O.J. himself, that nobody really stopped to think that two people were brutally murdered. So many were willing to exploit their deaths for whatever gain or ends they were seeking to the point of it being disgusting. BigJ doesn't get into the true crime documentaries that often, but even he found "O.J. : Made in America" utterly engrossing and extremely interesting, even though he still has a vivid memory of the trial from when it happened initially. Personally, I'm all about true crime stories and documentaries, so I loved this film, even though it is difficult as hell to watch. I only vaguely remember the O.J. Simpson trial when it actually happened, but this makes sense considering I was not even 10 years old when it was going on. The way Ezra Edelman exams the overall social climate and the overall cultural impact regarding all that surrounded Simpson, from his narcissism to his violent streaks, from his time as a movie star and football player to his ultimate incarceration, helps elevate it above other documentaries that only take a surface level approach to true life stories such as this. It is a long watch, but an imperative one if you like documentaries of this type.